Balsamic Chicken with Roasted Vegetables seasoned with sage, rosemary and balsamic vinegar, then baked in the oven. A delicious healthy meal-in-one! Adapted from my friend Julia of Julia’s Healthy Italian. She’s a mom of four small kids, with a full time career and an amazing cook. I shared this a few years ago, but since I’ve made some minor changes to the original recipe. This is an easy weeknight dish, with quick easy prep. If you want to add a grain to the side, quinoa would be great. For easy clean up you can line the tins with foil. 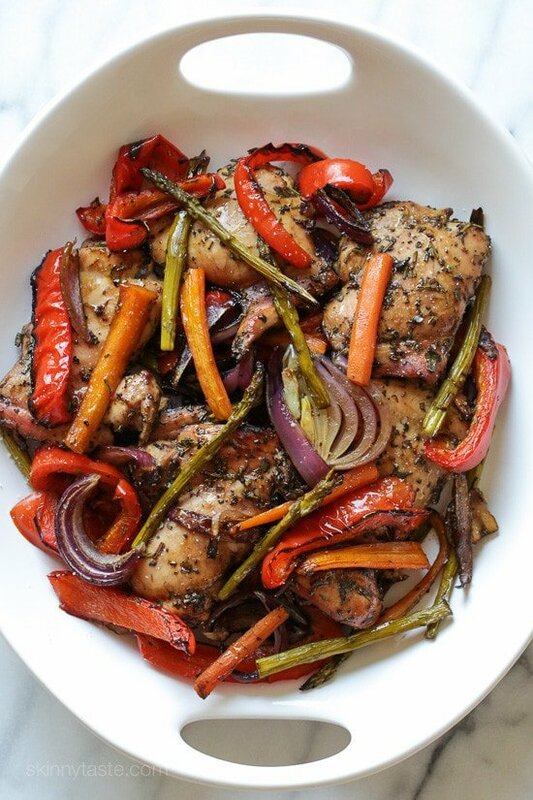 Chicken and vegetables seasoned with sage, rosemary and balsamic vinegar, then baked in the oven. A delicious healthy meal-in-one. Season chicken with salt and pepper. Spray 2 large baking sheets with oil. Combine all the ingredients together in a large bowl using your hands to mix well then arrange everything onto the prepared baking sheets spread out in a single layer. Bake about 20 to 25 minutes, rotating the pan top to bottom, or until the chicken is cooked through and the vegetables are roasted and tender. I am confused. Do you combine the chicken with everything else and then separate it, or cook the chicken dry and combine later? Thx! This was very yummy! Used Herbs de Provence instead of the spices as a cheat. Still very delicious. Added zucchini into the mix. Another keeper Gina! I am going to make this tonight and I have chicken tenders instead to cook up. I am wondering if I should do veggies in a separate pan and put in oven first as the tenders might be done before them. Also, should I decrease the oven temp down to 350 degrees being that chicken tenders are smaller? Any advice is welcome. Thank you. 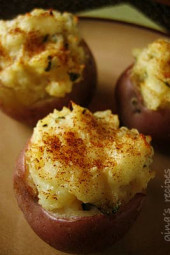 This is probably my all time favorite recipe on SkinnyTaste. I make it weekly and just rotate the vegetable with what is on sale and in season. I put it together in the morning and leave it in my fridge to marinate until dinner. Thank you so much Gina! My family loves your cooking style and we love your weekly planner fòr mòst of our meals. What does “rotate the pan top to bottom” mean? I’ve done lots and lots of cooking over the past 25 years and have never seen the term top to bottom used when a recipe instructs to rotate the pan! Since you prepare two baking sheets, you put half recipe on one and half on the other halfway Thru Cooking. Time, move the one on top rack to bottom and bottom pan to top so it cooks evenly. America’s test kitchen does this all the time. It allows for evening cooking. Once again another delicious recipe! I used boneless, skinless chicken breast for less points. The flavor is so good I think I’ll roast veggies like this more often (typically I just roast them in olive oil and sea salt & pepper). 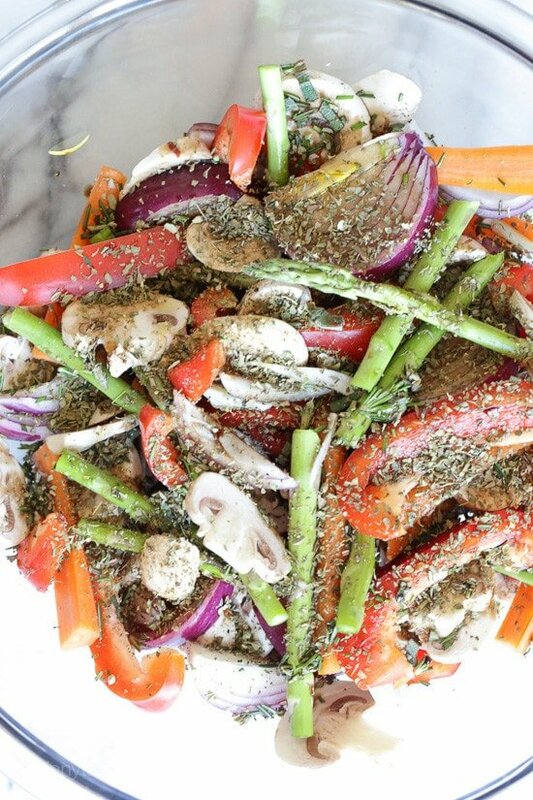 I tried making this tonight….what kind of pan(s) is big enough to hold all of these ingredients without touching the chicken? I ended up putting the chicken on one pan and the vegetables on another. It didn’t really turn out how you described. Any suggestions? The recipe seems great! You have to use recipe builder to get accurate points. This was great. I only had one red pepper so I used a large parsnip instead. The none of the flavors were too over powering and the chicken came out nice and tender. I used parchment paper to avoid sticking. This was so delicious! Used sweet potato, mushrooms, and brussels sprouts for the veg. My 2 yo inhaled her entire dinner and asked for seconds! I have made this multiple times. It’s a delicious and flavorful recipe. It’s just a bonus that it is so healthy! This was so easy and so good! My husband said it’s his favorite thing I’ve made! Being someone who loves balsamic vinegar, I thought that it would be a great recipe. However, I was very wrong. This is honestly one of the worst meals I have ever had. The recipe was followed exactly but in the end it made me sick and I had to throw it all out. If you read this, I do not recommend. How do you feel about throwing some zucchini or squash in there? I wasn’t sure if they’d dry up too fast compared to the other vegetables. I stuck to the original recipe last time and it was amazing! You say to rotate the pan from top to bottom. I’m not much of. a cook so I want to make sure what you mean? Also, I want to make this for 2 very light eaters and I’m not sure how to reduce it?? I just want to make three thighs…. thank you….I’m new to your blog and everything looks SO delicious and simple. Even I can attempt it? Since you prepare two baking sheets, you put half recipe on one and half on the other halfway Thru Cooking. Time, move the one on top rack to bottom and bottom pan to top so it cooks evenly. I make this meal a couple times a month. I always double the recipe for leftovers, so I use 2 pans (one chicken, one veggies). Delicious! Is the nutrition per serving or for the whole meal??? Has anyone tried this using dried rosemary and dried sage instead of fresh? If so, does it turn similar? YES…it turns out fine with dried herbs. This was delicious! We made it for dinner last night and I’ll definitely be making it again! 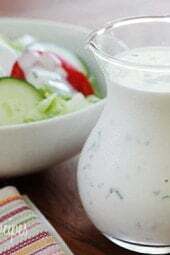 I have made this recipe several times and love it! Balsamic vinegar is one of my favorite ingredients, so I am happy to eat it on more than just a salad. Five stars! Made this again last night and it was soo good. Great for using up stray vegetables in the fridge. 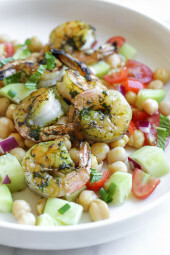 We absolutely love this dish! I prepared the veggies in the morning and put it in the oven after church for the family. It was ready in 20 minutes. Thanks for all your recipe help. I see that it’s been asked a few times, but have you tried this in an Instant Pot? I’m trying to figure out how much liquid to add without it becoming soupy. I have not had a chance to yet! This is one of my go to meals! Delicious. And works well with other vegetables on hand. I also make an extra batch of vegetables for another night’s meal! This was soooooooo good! A keeper! winner winner chicken dinner! see what i did there? 🙂 thanks gina, as always! Hi! looks amazing! If using boneless skinless chicken what would the cook time be? My family always makes one poultry and one beef recipe for our Jewish Holiday dinners. This past Rosh Hashanah this was our poultry dish. It was a huge hit with the entire family. We had to quadruple the recipe but it was just as good as when we only made one batch! Definitely will keep this on the menu, especially for guests since it’s so simple to make. I went to Weight Watchers mobile and calculated the recipe and came out with 5 freestyle points.. Tasty Meal.. This was one of the first Skinnytaste recipes we made and it had us coming back for more! The chicken turned out juicy and the veggies were the right texture and so full of flavor. Love the one-pan mentality and how easy it is to cook it all together. This is a great weeknight, easy to throw together meal and one we’ve made many times since! Could another vegetable be used in place of asparagus? Which would be a comparable substitute? Fresh Green Beans instead of asparagus works fine! This was fabulous! I used what I had on hand, which was chicken breasts, one yellow pepper, a sweet onion, and lots of carrots. I only had dried herbs. It didn’t taste like it was lacking anything. Can you do ‘‘tis in a instant Pot ? I entered this into WW tracker and it came out as 8 points with Chicken thighs and 3 points with chicken breasts. Balsamic vinegar has points and chicken thighs are not zero point foods. The recipe is incorrect in calculating the smart points. With that said I love this reipe. I think she is right, 8 points. Balsamic is 4 (1/4c plus 1TBS = 5 Tbsp). 2 Tbsp Olive oil adds 8. I love your recipes too and will plan to try this one soon. The ladies here are correct and this calculates out to 8 points per serving. The 1/4 plus 1 tablespoon of balsamic you have listed calculates as 4 SP, not 1 and you’re omitting 8 SP worth of olive oil in the calculate here. I love this dish. I doubled the rosemary sage garlic and thyme. I added eggplant because I had some hanging around. I live alone. Can I freeze portions of this meal? I tried this tonight, but it didn’t work out. The sauce burned onto the pan and trapped my veggies in it 🙁 I’ve loved every other one of your recipes! What did I do wrong? A keeper. Made it with short grain brown rice. Very easy. Fast, easy & good. Family approved! Will make again. I wound up using 2 pans; 1 for the veggies & 1 for the chicken. The recipe called for 1/4 cup plus 1 TBSP balsamic vinegar, but the video only shows the 1 TBSP being used. Is that just for the video, or is there a mistake in the list of ingredients? 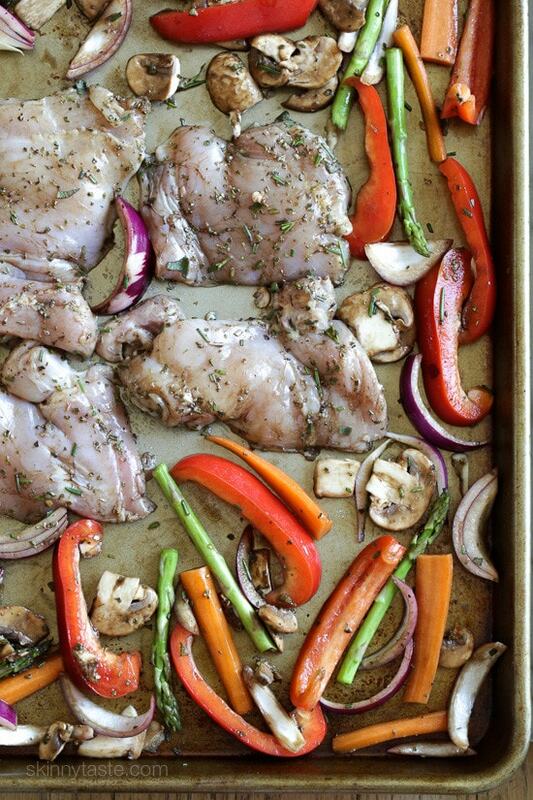 How large are the baking sheets you’re using to accommodate all of the chicken and vegetables? Ours don’t allow for so much, and while using two (or three) is fine, it would be great to get it done on one sheet instead. Any recommendations? I make your recipes all the time and this recipe looks amazing! Can I use boneless skinless breasts? If so, how long would you bake? You have such a great talent for this! You could use legs if you want. What part of the chicken would not matter. I just made it. Pounded out the breasts to about an inch thick and cooked for 30 minutes. I also left out the sugar in the recipe to take away more calories! Was just wondering what the time would be for bone-in thighs?? I made some tonight, half bone-in and half deboned. I put the bone-in thighs in 5 min earlier and in the end broiled them quickly to crispen the skin. Hope that helps and gives you an idea. Enjoy!